In our previous two articles regarding Shipping Settings and Shipping Methods, we stated that 3dcart shipping is composed of two separate sections that work closely together. However, there is a third section that can also come into play when configuring your cart's shipping capabilities. The third section of your overall shipping configuration is the Shipping Countries section. In this section you will be able to specify which countries and states you are willing to deliver to. 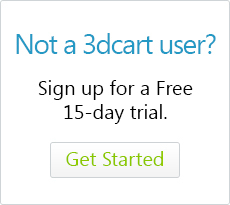 When you first set up your 3dcart store, ALL countries and ALL states are enabled. However, you may have specific needs which require you to limit the scope of your shipping area. For example, you may sell region specific media like Blu-Ray movies that only play on devices sold in specific markets, and selling them to the wrong market would only increase the amount of returned merchandise you get. Perhaps there are legal, or even product licensing reasons for limiting the areas you ship to. Whatever the case may be, you can specify exactly which countries your cart is able to ship to. Check the checkbox next to country you want to deliver to, uncheck countries you do not want to deliver to. Click the Save button located at the top right to commit your changes. You may also want to limit or enable specific states (these can be states/territories/provinces/etc) within your selected countries. For example, in the case of the United States as the country, your catalog of products cannot be shipped to a specific states due to their individual state laws. Or perhaps you only want to ship to specific provinces in Canada. Whatever the case may be, you can also edit the country selections to enable/disable or even add/remove specific "states" within these countries. Go to the country listing that you'd like to edit and look to the far right to click on it's "Actions/Check States" link. Check the checkbox next to a state to make that state available and click Save. Uncheck the checkbox next to a state to make that state unavailable and click Save. To remove a state, check the Remove checkbox next to a state to sand click Save. For your convenience, United States and Canadian Provinces have been pre-populated for you. Please be aware of how your shipping carriers handle specific territories. For example, some shipping carriers consider Puerto Rico as its own country, while some carriers consider it as an applicable state/territory for the US. Therefore you may need to specify Puerto Rice as both a country AND a US state to accommodate multiple carriers. Can I limit the countries available for billing/shipping? How do I control my store's shipping and billing countries? Where can I edit my country list?